One of the perennial challenges of virtually every aspect of life is balancing the achievement of our long-term goals and aspirations with the short-term imperatives. In theory balance should be easier to achieve at work where we are free of tasks such as cooking a meal, cutting the lawn or reading a bed-time story. In practice, it often seems harder at work where it is not uncommon for people to say that it is not until 5:30 that they finally got the time to start working on the bigger objectives they set out to achieve that day. While all the literature and training courses on the subject of time management will advise you to set aside time to work on your bigger goals, this is easier said than done when the short-term objectives are typically more urgent. Personally I think it is better advice to encourage people to take time to reflect and set out a plan – and the Christmas break provides the ideal opportunity. 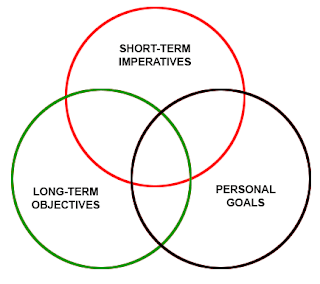 My suggestion is that you draw three circles on a page (as shown below) and label them short-term imperatives, long-term objectives and personal goals. In each circle write a list of the things you want/need to achieve. I am sure you can see where this is going, but I would caution that it would be naïve to believe that there are simple things you could write in the overlap area between all three circles. What you could do however is appraise each list and see what elements in that list could contribute to the achievement of your other circle goals. For example, suppose one of your personal goals was to retire early, but to achieve that you would need to earn more. It might be that you could increase your chances of promotion at work if you were more closely associated with the attainment of one of the long-term objectives and if you prioritised the short-term tasks set by certain people or departments over others. 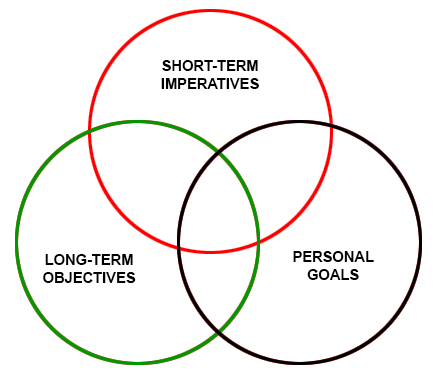 The objective is therefore not simply to write things in the overlap area (if they were that obvious you would most probably already be working on them) but rather to define and create your overlap area by steering everything you do towards your bigger goals. I hope you have an excellent Christmas.